Operatives of the Philippine Drug Enforcement Agency (PDEA) arrested three Taiwanese nationals and seized more than ₱1.4 billion worth of shabu, chemicals and laboratory equipment at a clandestine drug laboratory in Las Piñas City and a warehouse in Parañaque on Tuesday night 5th July 2016. Wilkins Villanueva, director of the PDEA National Capital Region Office, identified the three arrested suspects as Shi Ming Tsai, Kuo Chuan Cheng and Chun Ming Lin. Tsai and Cheng, both suspected chemists, were arrested in a house that was turned into a shabu laboratory in Barangay Pamplona Dos in Las Piñas at around 6 p.m. after the PDEA agents enforced a search warrant issued by Judge Fernando Sagun of the Quezon City Regional Trial Court Branch 98. 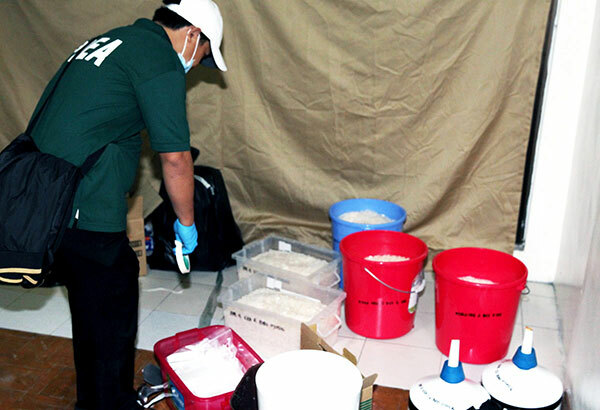 Around 49 kilos of shabu, placed inside pails, 298 kilos of suspected liquid methamphetamine and laboratory equipment were seized inside the house. Newly appointed PDEA chief Isidro Lapeña joined the operation in Las Piñas. After the successful operation, PDEA agents also dismantled a shabu storage facility located at BF Homes, Parañaque City at around 7:30 p.m.
Lin was arrested inside the warehouse where 10 kilos of suspected shabu and around 200 kilos of suspected ephedrine were found. Villanueva said ephedrine, an ingredient in the making of shabu, was stored in Parañaque and brought to the house in Las Piñas for processing into shabu crystals. The manufactured drugs would then be brought to the Parañaque warehouse for storage before distribution to dealers in Metro Manila and Central Luzon, he added. Villanueva said PDEA agents conducted surveillance operations in the area for about a month before the raid. 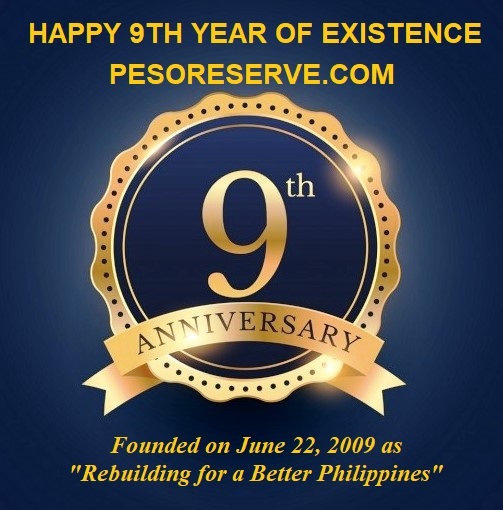 Investigators said a Taiwanese family has been renting the house in Las Piñas. Eight suspected drug pushers were gunned down last Tuesday and Wednesday during alleged shootouts with policemen in various parts of the country while unidentified suspects killed seven more alleged pushers. Media reports showed that there were about 85 people killed in drug-related police operations from May 10 to July 6. Of the 85 slain suspects, 31 were shot dead from July 1 to 6 or during the first six days of the Duterte administration. Caloocan City policemen shot dead yesterday two alleged drug pushers during separate encounters. Investigators said policemen responded to a call through Emergency Hotline 117 that three men were suspiciously roaming around Barangay 59 at 3 a.m. The police spotted suspect Michael Liwanag and his two companions along R. David Street and when the officers approached them, the trio ran toward a nearby house owned by Norayda Coloma. Liwanag entered the house and fired gunshots at the policemen who fired back and killed the suspect. Another suspected pusher, Roberto Dominguez, was killed last Tuesday night by policemen investigating the illegal drug trade along Burgos Street in Barangay 15. Initial police report showed that policemen spotted Dominguez along Burgos Street and tried to question him. Dominguez, however, fled and ran to a house and shot at the police officers. The policemen fired back, killing the suspect who yielded a caliber .38 revolver, five small plastic bags of shabu and drug paraphernalia. Two suspected drug pushers were shot dead by police authorities in separate encounters in Camarines Norte and Legazpi City last Tuesday. Supt. Wilmor Halamani, Daet police chief, said an undercover policeman shot dead suspect Christian Roy during a buy-bust operation in Barangay Magang. In Legazpi City, Michael Almayda was shot dead after a shootout with police during another entrapment operation in Purok 3 Barangay 42 in Legazpi City. Almayda's three companions, identified as Edgardo Almayda, Nino Almayda and Norby Alzaga, were arrested. Seized from the suspects were 12 plastic bags of shabu and a caliber .38 revolver. Manila policemen killed a drug pusher that also snatched cell phones in San Andres, Manila. Police officer 3 John Teddy Siguen, who was investigating cellphone robbery cases, shot dead Conrado Beroña III in his house at 2323 Tenorio Street in San Andres last Tuesday. Investigators recovered nine sachets of suspected shabu from the suspect's house. Siquen said they were following up two cellphone robberies and tracked down the suspect's location through the global positioning system (GPS) in one of the stolen phones. Policemen went to Berona's house but the suspect fired at the policemen, who fired back and killed the suspect. Two persons were killed in separate shootouts during anti-illegal drug operations by the Quezon City police yesterday and Tuesday. Artemio Aclan was gunned down along Algao St., Barangay Tatalon at around 11:30 a.m. while police were conducting Oplan Kapak (Katok Pakiusap) on Tuesday. Investigation disclosed that police spotted Aclan while they were scouring the area for drug dependents. Sensing the presence of operatives, Aclan reportedly ran to his house, got his handgun and fired at the police officers. He was killed after a brief firefight with police. A improvised caliber .38 revolver and 12 sachets of shabu were recovered from Aclan's house. A still unidentified drug suspect was killed in a shootout along Feliciano Street in Barangay Pasong Putik at around 2:30 a.m. yesterday. The suspect, described by police as around 20-25 years old and 5'3" in height, was shot dead while his cohort was able to elude arrest. Police reportedly responded to a tip about illegal drug activities in the area when they saw two men on their motorcycles. When police officers approached the suspects, the two suddenly drew their handguns and fired at the lawmen. This led to a brief firefight, resulting in the death of one of the suspects while the other escaped. In Dagupan City, a suspected drug dealer was shot dead in a buy-bust operation Tuesday night in Barangay Tebeng. Dagupan police Supt. Christopher Abrahano said Oscar Abella, who was included in the watch list of the Barangay Anti Drug Abuse Council of Barangay Pantal, pulled out a gun and fired at the police undercover agent who fired back. Motorcycle-riding gunmen shot dead Marvin Toston, a suspected pusher, at the corner of Gabriel and Claudio streets in Baclaran, Parañaque City yesterday. In Nueva Ecija, five suspected drug pushers were killed by unidentified men in the past four days, police said. Senior Supt. Manuel Cornel, provincial police director, said the slain suspects were identified as Mirasol Lavapie Ramos of Talavera town, Jessie Junarez of San Antonio town, Daniel Javier of San Leonardo, Raffy Francisco of Sto. Domingo and a certain Bernie of San Jose City. A lone gunman shot dead Ramos in a barbecue stand in Talavera. Police said five men took Junarez from his house last Wednesday in San Antonio. The victim was later found dead. In San Jose City, Police Officer 1 Danilo Lorilla Jr. shot dead the suspect identified only as Bernie. Bernie alleged shot at Lorilla who fired back and killed the suspect. Police said Javier was found dead in San Leonardo town while the body of Francisco was recovered in Sto. Domingo. In Cagayan, Senior Insp. Antonio Palattao, police chief of Allacapan town, said an unidentified gunman shot dead suspected drug pusher Norman Tacal during a drinking session in Barangay San Juan last Tuesday.